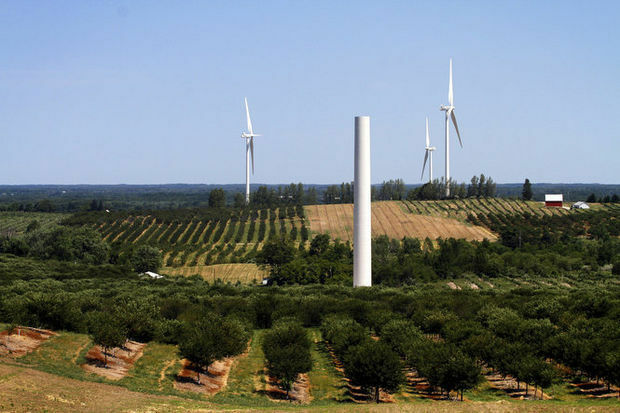 LUDINGTON, MI – Consumers Energy Co. and the original 17 Mason County residents who sued the company over its Lake Winds Energy Park wind farm south of Ludington have settled their lawsuit on the eve of trial. Settlement negotiations continue with two other plaintiffs who joined the 2013 lawsuit later, attorneys said. In their case, a trial in Mason County 51st Circuit Court has been postponed until after the first of the year. Terms of the settlement with the first 17 plaintiffs are confidential. The deal was reached over the weekend and entered on the record Monday, Oct. 20, heading off a trial for which a pool of jurors was already assembled in court. “Consumers Energy is pleased to have reached an agreement to settle with 17 of the … plaintiffs, and we are hopeful to do the same with the remaining two parties,” the company said in a statement released by spokesman Dennis Marvin. “While we remain confident that the law and facts support Consumers Energy’s position, it is in the best interest of our customers to avoid the expense and uncertainty of what was likely to be a lengthy court process. The plaintiffs’ lawyer, Craig W. Horn of Saginaw, declined to comment on the settlement, citing its confidentiality provisions. The $250 million Lake Winds Energy Park development in Mason County’s Riverton and Summit townships, between Ludington and Pentwater, generates 100.8 megawatts of electricity. Its Vestas turbines are 312 feet high at the hub, with rotor blades having a 328-foot diameter.